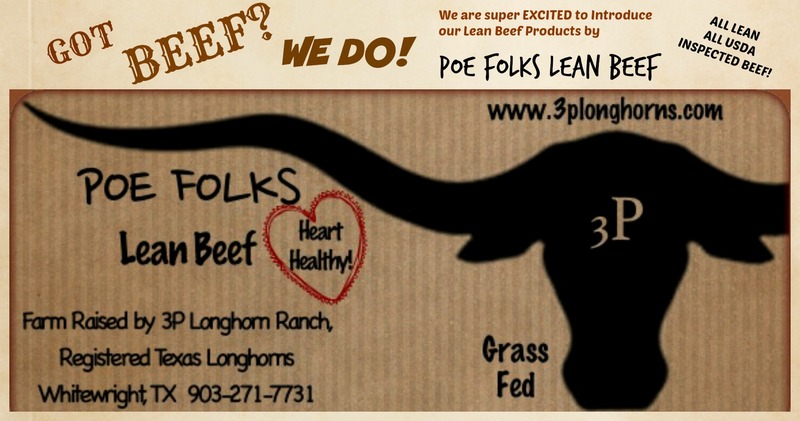 We are SUPER excited to expand our Grass Fed Beef program in 2015 to now include custom packaged Lean Beef! ALL of our beef products are 100% Registered Texas Longhorn, LEAN, Heart Healthy, Grass Fed, No Hormones, BEEF! Our beef is dry aged for 10 days to add flavor to the meat. Click here to read about the health benefits of eating lean, grass fed beef. We are still taking orders for half or whole beef. Orders are based on hanging weight which averages 250-300 pounds. Our price is $4.00 per pound of hanging weight, plus processing costs of .78 per pound. (See our price list) We drop off at our USDA facility, you order the cuts you want! We will deliver to the Dallas/Ft.Worth area only for all custom processing orders of half or whole beef orders. FREE DELIVERY for our custom packaged products in the Dallas/Ft. Worth area for orders over $100! Sorry, we do not ship at this time.